You’ve made the investment on your iPhone, but want to protect it from everyday bumps & scratches. Well I have the perfect solution for you! I’m very excited to announce exclusive iPhone cases featuring original photography from around the world. My original iPhone cases cover the back and corners of the phone. It’s form fitting, but provides access to all buttons and ports. So whether you’re making a call, checking your email or rocking your social media, today’s iPhone cases from Esquire Photography will help you do it in style. You can be transported to the “City of Lights” with an original photograph of the Eiffel Tower either in the beautiful Paris daylight or with a full moon at night shining in the sky. Or you want to go back to my home country of London, England. 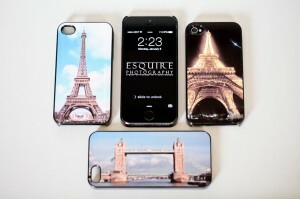 Then you’ll want to wrap your iPhone with the Tower Bridge in all it’s majesty over the Thames River. There are many more cities & monuments to come from my travels filming & photographing “Picture Me – Picture You“, the world’s first travel & educational program filmed entirely on mobile phones – so definitely check back often. The original Esquire Photography iPhone cases will perfectly fit your iPhone 4, 4s, 5 and 5s and are retailing for $45.00 plus shipping (and tax for CA residents). When you’re ready to place your order – feel free to email me at (info @ esquire photography dot com) or you can reach me on my Contact Me page.